Died of influenza and pneumonia. Flintshire Observer 12th December 1918 (Page 3, Col. 4) where Thomas Arthur was referred to as a Lieutenant. 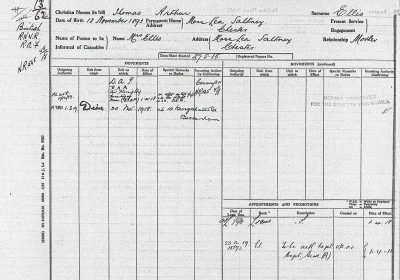 I found Thomas Arthur’s death when I was searching the Newspapers and then when I entered Saltney onto the Commonwealth War Graves Commission website. In 1918 the death toll in Flintshire was one of the worst in the country and many servicemen died. He was born 11th November 1893 to Thomas & Sarah Sophia ELLIS (nee KENT), they are seen for the first time on the 1901 census living at 14, Chester St., Saltney, Chester. Head of the household was father Thomas Ellis, 38 and a Schoolmaster, born in Saltney. 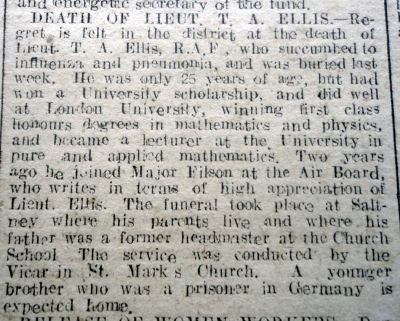 His wife Sarah S. Ellis was34 and had been born in Fenton, Staffordshire, their 2 sons Thomas A, 7 and Eric Kent Ellis, 3 had both been born in Saltney. Sarah Sophia had come to work in Chester as she is seen on the 1891 census living at 14, Mount Pleasant, Chester.(St. Mary’s without the Walls). She was a Boarder, age 23 and an Elementary Schoolmistress, born in Stoke-on-Trent, living in the household of Mary A. Griffiths and her daughter Annie. Thomas Arthur had won a University Scolarship to London University winning first class honours in Mathematics and physics, then becoming a Lecturer in the University in pure and applied mathematics. 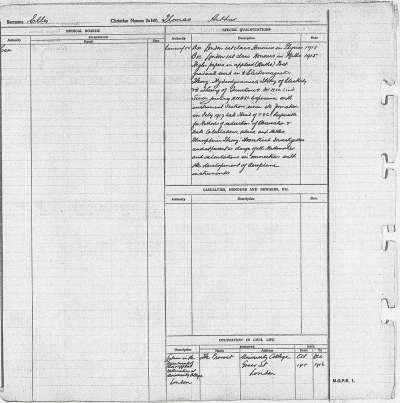 I asked the Army Forum http://1914-1918.invisionzone.com/forums/index.php?/topic/241054-royal-air-force-ministry-of-munitions-and-royal-air-force/ about where I might find his records and nieuport11 replied with this information, many thanks to him. Higher papers applied (Maths) Post graduate work in Electromagnetic Theory. Hydrodynamics Theory in Electricity & *& Theory of Junctions* for Msc.1end?. Since joining RNASL Experience with instrument Section since it’s formation in July 1917. Late Head of TB9or*)C. Responsible for methods of reduction of Observation & Tests Calculations, abacs, and tables. Atmospheric Theory. Theoretical Investigations and at present in charge of all Mathematices and calculations in connection with the development of Aeroplane Instruments. Occupation in Civil Life. :-Lecturer in the Departments of Pure and Applied Mathematics at University College, London. 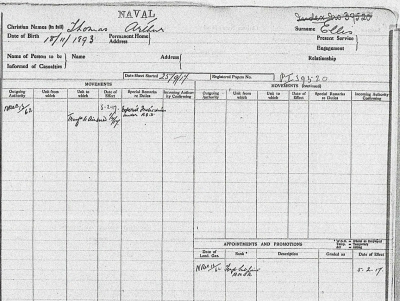 Movements – Date of Effect – 5th Feb 1917 – Special Remarks re Duties – Experence Intr dutied under A.S.D. His appointment to Acting Captain is in the London Gazette 23/12/19. Date of Entry into Air Service – 5th February 1917- he joined Major Filson at the Air Board, who when Thomas Arthur died wrote about him in high appreciation. The Service Papers above gives more information on his short career. ELLIS, Thomas Arthur of Moss Lea, Saltney, Cheshire, Captain Royal Air Force died 20 November 1918 at 10, Kingshull Road, Beckenham, Kent. Administration Chester 30 October 1920 to Sarah Sophia ELLIS, Widow. Effects £297 15s 7d. How sad that Thomas Arthur was to die, especially of the influenza and pneumonia, when he obviously had so much to give and would have contributed to the war effort, indeed to the world.